This list provides an overview of CD review guides, discographies, and books geared towards collectors of recordings. Gramophone Classical Music Guide 2010. James Jolly (Editor). Gramophone Publications. September 2009. ISBN 0860249220 (paperback) - Shown: 2009 ISBN 0860249522 (paperback). 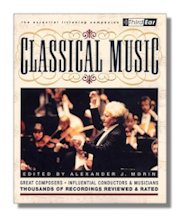 This popular guide draws upon the magazine's 85-year experience of reviewing classical music on record reviews 3500 recordings that cover the full spectrum of classical music, from the Middle Ages to the brand new, from Grand Opera to Lieder and song, from string quartets to organ music. The guide offers authoritative opinions from Gramophone magazine's roster of critics on recordings from popular works like the Beethoven symphonies to more obscure repertoire for the classical music aficionado. 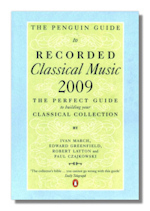 The Penguin Guide to Recorded Classical Music 2009. Ivan March, Edward Greenfield, Robert Layton (Authors), Paul Czajkowski (Editor). Penguin. November 2008. ISBN 0141033355 (paperback). The Penguin Guide has been one of the most successful guide to classical music for more than forty years. Fully revised by its team of eminent authors and written with wit and passion, The Penguin Guide to Recorded Classical Music offers reviews of all the latest releases as well as the finest established recordings. It also includes an overview of the greatest historic performances, major period instrument recordings, an in-depth survey of the best of the budget-priced CDs, and the core collection of 100 handpicked, must-have CDs. Now published annually for the first time, this book is essential reading for every serious classical music fan. Classical Music: Third Ear - The Essential Listening Companion. Alexander Morin, with 52 contributors. Backbeat Books. April 2002. ISBN 0879306386 (paperback). The authoritative, accessible CD review guide to classical music – for novices and aficionados alike. This well-balanced guide to classical music examines historical and contemporary works by American, British, German and other composers, some dating back to the 1500s. It focuses on the very finest recordings of symphonies, operas, choral pieces, chamber music, and more performed by an international spectrum of premier conductors and musicians. Thought-provoking profiles highlight each composer's unique characteristics and contributions to the classical world. Incisive, often anecdotal critiques of selected works and exemplary recordings emphasize distinctive style and interpretation. Historical essays explore the classical repertory from medieval to electronic, Broadway to Hollywood, and more. Written in vivid language, this comprehensive guide also profiles conductors, artists, and instruments. Composers include: Bach, Beethoven, Bernstein, Brahms, Cage, Chopin, Copland, Debussy, Gershwin, Gilbert & Sullivan, Glass, Haydn, Ives, Mahler, Mozart, Puccini, Ravel, Reich, Satie, Schubert, Stravinsky, Tchaikovsky, Varèse, Wagner, Weill, and hundreds more. Alexander Morin, a regular contributor to American Record Guide and Classical Net, is the founder, president, and editor-in-chief of Aldine Publishing Company. He is a former managing editor of the University of Chicago Press. 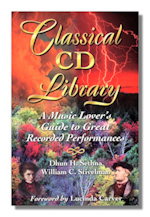 Classical CD Library: A Music Lover's Guide to Great Recorded Performances. William C. Stivelman, with Dhun H. Sethna. The Fitzwilliam Press. 1998. ISBN 0964410346 (paperback). Contains both biographical information and a section on recommended CDs. A Jussi Björling Phonography, 2nd Ed. Harald Henrysson. Svenskt Musikhistoriskt Arkiv, Stockholm. 1993. ISBN 9185172103 (paperback). An invaluable source for all lovers of this great tenor. An outstanding phonography. 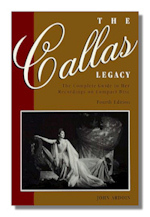 The Callas Legacy: The Complete Guide to Her Recordings on Compact Discs. John Ardoin. Amadeus Press. 1995. ISBN 093134090X (paperback). This detailed analysis of every record made by Maria Callas examines the development of her art from her first recordings in 1949 to the last in 1977. The Grand Tradition: Seventy Years of Singing on Record. J. B. Steane. Amadeus Press. 1993. ISBN 0931340640 (hardcover). Herman Klein and the Gramophone: Being a Series of Essays on the Bel Canto (1923 the Gramophone and the Singer). Herman Klein, William R. Moran. Amadeus Press. 1990. ISBN 0931340187 (hardcover). BBC Music Magazine Top 1000 CDs Guide: A Critical Guide to the Best Classical Music CDs, Erik Levi (Editor), et al. Amadeus Press. 1996. ISBN 1574670182 (paperback). 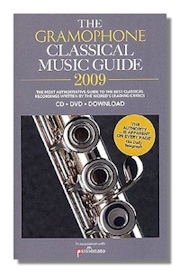 This guide offers both the beginning collector and the serious connoisseur informed assistance in finding the preferred recordings of the most significant classics. The user-friendly book contains reviews, a section on how to expand your CD library, and articles on the impact of historical recordings.